BOSTON – Wednesday, May 24, 2017 – Mayor Martin J. Walsh today announced that the City of Boston’s Office of Arts and Culture, in partnership with the Mayor’s Mural Crew, the Boston Art Commission and Mass Poetry recently installed a new round of Raining Poetry in neighborhoods around Boston. 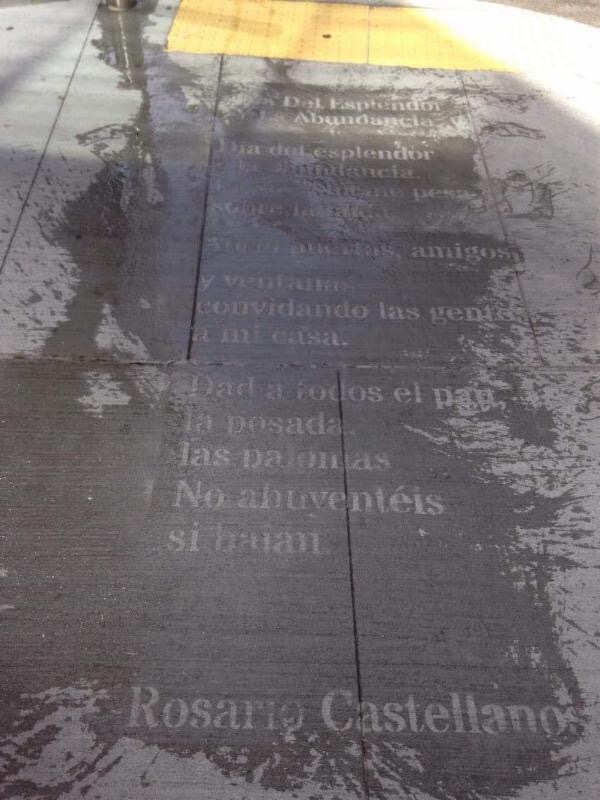 Stenciled on Boston’s sidewalks with water-repellant spray, hidden poems emerge when it begins to rain. The first Raining Poetry installation was launched in 2016 when the Mayor’s Office of Arts and Culture collaborated with Mass Poetry. Since the program’s initial installations, Raining Poetry has been implemented by other cities and organizations across the U.S. and around the world including Houston, Charlotte, Vancouver, Budapest and Singapore. The stencils used for this year’s Raining Poetry installations were designed by Lesley University students as part of Professor Heather Shaw’s Typography II class. The students worked with Boston’s Poet Laureate to interpret the literary works through typographic expression in order to communicate each poem’s tone and message. Both typeface choice and positioning of letterforms were taken into consideration when making design decisions. The Mayor’s Mural Crew then installed the poems using these stencils. To date, the Mayor’s Mural Crew has installed 16 poems throughout the neighborhoods of Boston. “One of Mass Poetry’s missions is to bring poetry to people, particularly to those who don’t usually have the chance to interact with it. Raining Poetry has been great because it facilitates an engagement with poetry in a surprising and unsuspecting way,” said Sara Siegel, Program Director for Mass Poetry. For more information about the Raining Poetry, click here. The cultural plan is a ten year plan for supporting arts and culture in the City of Boston. It was created out of a year-long community engagement effort designed to help local government identify cultural needs, opportunities, and resources and to prioritize, coordinate, and align public and private resources to strengthen Boston’s cultural vitality over the long term. The full cultural plan can be found online athttp://plan.bostoncreates.org. Boston Red Sox Invite Vietnam Veterans On Field At Fenway Park!